Migration from eBrary (one of our 2 main e-book suppliers) to ProQuest Ebook Central will take place the afternoon of Wednesday January 11, 2017 (midday pacific time) NO DOWNTIME IS EXPECTED. The new interface is very similar to the old with all the features of eBrary: custom bookshelves, tagging, highlighting, citations, sharing, etc. Registered users should find their previously saved titles and links all working and redirected. Emerging Technologies librarian Heather Rayl has had a busy summer, helping a Communication Department team convert the Comm 101 textbook into an Open Education Resource text. She also maintains a guide to OER information at Open Educational Resources. As more faculty become aware of the OER movement, workshops are being provided to spread the info. The next workshop will be held Tuesday September 20, 2016 in the Faculty Center for Teaching Excellence, Library room 103, 3-4pm. Promo: Are you frustrated with your textbook? Are you looking for ways to inject more custom materials into your class? Then Open Educational Resources might be the answer for you! Stop by the Faculty Center for Teaching Excellence for a workshop on what OERs are, how to find them, and maybe even earn some money on the side just for converting your class! Light refreshments will be served. 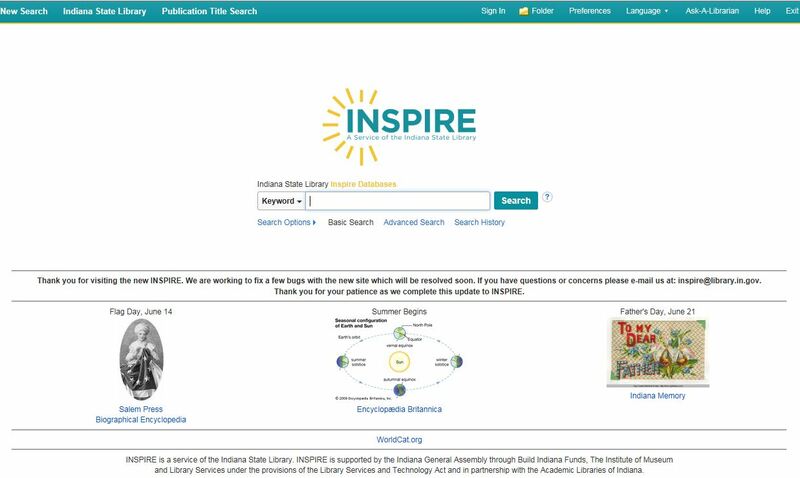 While ISU people have access to the world of information thru a variety of databases, all Indiana taxpayers not associated with colleges and universities have access to some of the same or similar resources thru INSPIRE, Indiana’s Virtual Library. For a list of the databases, from the opening screen, click Help and scroll down or do a search and look thru the resulting facets. A new version of INSPIRE (Inspire.in.gov) has launched. The overall user experience has improved with better search results and new features. This is a ‘soft launch’ and ISL staff are testing the site and fixing a few issues. Within the next week a brief tutorial of the changes will be sent to the listservs. Please tryout the new INSPIRE and send any comments or questions to inspire@library.in.gov. Users are not currently able to search some Gale resources, including TERC (Testing Education Resource Center), but the issue will be resolved shortly. INSPIRE has been around since 1998! Be sure to try it out if you haven’t already. During 2014 INSPIRE statistics were performed! CLARIFICATION: SCIENCE DIRECT USERS WHO ARE ALREADY REGISTERED WILL BE ABLE TO SIGN IN AND USE ALL THE FEATURES OF THE DATABASE INCLUDING TRANSACTIONAL ACCESS. Indiana State University Library through its membership in the MetaArchive Cooperative digital preservation network is a research partner for a newly awarded IMLS Leadership Grant: “Preservation & Curation of ETD Research Data & Complex Digital Objects.” Kayla Siddell in her capacity as data curation librarian will represent Cunningham Memorial Library in this important work. The Educopia Institute, in partnership with University of North Texas, and in concert with the Networked Digital Library of Theses and Dissertations (NDLTD), HBCU Alliance, bepress, ProQuest, and the libraries of Virginia Tech, University of Tennessee, Purdue, Carnegie Mellon, Oregon State, Penn State, Morehouse, University of Louisville, and Indiana State propose a two-year project to improve ETD policies and practices around research data and complex digital object management nationally. The project will answer the question: How will institutions ensure the longevity and availability of ETD research data and complex digital objects (e.g., software, multimedia files) that comprise an integral component of student theses and dissertations? This project will coalesce, refine, and shift the knowledge accumulation out of its campus or regional contexts and build upon it to create more generalized yet adaptable guidance documentation, shared curation technologies, and corresponding training materials that can be adopted broadly by ETD/IR stakeholders. To document needs and practices across all tiers of higher education, including smaller, less-endowed institutions, the project will conduct descriptive studies (surveys, interviews, and focus groups) and technical analyses (environmental scan, inventory, gap analysis and functional requirements). The project includes structural and strategic evaluation and outcome measurement activities. These include engaging an Evaluator to advise on data gathering methods and design implementation evaluations; input from the Project Steering Committee and Project Advisory Group; and Partner Site Evaluations followed by a four month Public Review period to gather qualitative and qualitative data on fit-to-purpose, effectiveness, and areas requiring improvement. Feedback will guide refinements in the deliverables. To login to library databases from off campus, we encourage you to use the link in the upper right corner of the Library homepage. You will be taken to the MyISU portal webpage. After logging into MyISU, you will be redirected back to the Library Web site to continue working. If you click on this link while on campus, nothing will happen. You must be off campus to be asked to login. The Library is still resolving some of the technical difficulties from other webpages, but the homepage link mentioned above is working. The ISU Library is experiencing access problems from off campus to online resources. We are working to resolve the problem as soon as possible. Sorry for the inconvenience.